The famed quote from Mahatma Gandhi says, “Be the change you wish to see in the world.” Except, to me, I don't think we've changed enough. And by “we,” I mean my generation and those before mine. I believe that recent climate change reports, the rise of mass shootings, school violence, national leadership, and the daily loss of black lives—to keep it brief—prove as much. 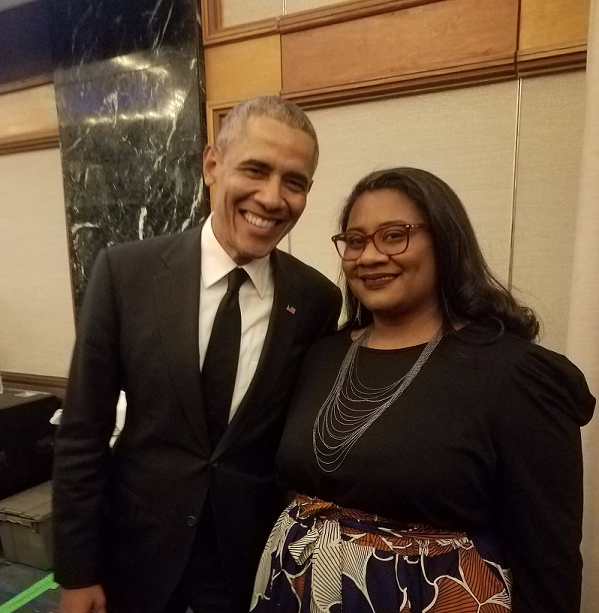 This past December, I had the distinct honor of dining with President Barack Obama at the annual Ripple of Hope Gala, commemorating the 50th anniversary of Robert F. Kennedy’s presidential campaign and honoring Obama. As if that evening could not have been more extraordinary, I was afforded an opportunity to share a testimonial about my students and their work with the RFK Human Rights education program, Speak Truth to Power (STTP). I teach theater and English in South Los Angeles. About three years ago, I directed Speak Truth To Power: Voices from Beyond the Dark with my students. The play, based on Kerry Kennedy’s book with a similar title, is a series of vignettes that document the narratives of the most amazing human rights defenders around the world; some stories are too harrowing to swallow without erupting in tears. Over the course of the production, my kiddos made quantum leaps as scholars, artists and leaders. They took it upon themselves to host a town hall after each show to unpack some of the issues presented in the play. They created elaborate and interactive foyer displays to engage guests in considering their role as human rights defenders. On opening night, which fell on International Human Rights Day, we had a donation drive for our community instead of ticket sales. But there was one student in particular whose experience was beyond memorable for me, his family and the entire team. I’ve known him now for about five years and he happens to have autism, or autism spectrum disorder (ASD). At the time of our production, however, we were just getting to know one another. Social cues were very difficult for him and speaking publicly was a challenge. In our production, he took on the role of “Man” after stepping in as an understudy. The part called for him to be on stage for the entire two-hour production. I thought it might be distressing for him. However, over the span of the production, he became a different person; he found his voice. I saw him blossom into a young man and leader. During the run, I noticed new relationships begin to form with teammates. Most notably, he began actively cultivating friendships with other students who had similar challenges and needs. This young man took them under his wing and made himself their mentor. He worked with them, making sure their homework was done on time. He planned social gatherings on the weekends. He even took his advocacy into the community supporting autism awareness organizations. Up until this point, his team had respected his wish to not be touched; they understood his discomfort with social situations and affection. This night was different. The circle ended with a simultaneous eruption of woo-hoos and the biggest group hug you can imagine. Over the years, RFK Human Rights has played a major role in my professional practice and the lives of my students. I now serve as a lead educator for the program and am ecstatic to share Speak Truth To Power: Raising New Voices In Human Rights—made possible through our recent partnership with Discovery Education. Based on my previous experiences with youth and STTP, I have no doubts that this initiative will help inspire global citizenry in learning environments around the world. I am not ashamed to admit I am a fangirl for these defenders; they are everyday people who do extraordinary acts on behalf of other human beings simply because it's right and just to do so. I am especially fond of the young ones. Their bravery, courage and narratives encourage me to continue learning and growing. Moreover, they motivate my students and inspire my daughter. All of the lessons on Speak Truth to Power defenders are amazing, in-depth looks into their work and regions of the world where they live.The lessons effectively present the defenders in such inspirational ways that it would be hard not to aspire to emulate them. One of my favorite—and recently added—defenders is Sonita Alizadeh of Afghanistan. She is a pillar of Generation Z and is changing the globe one rap verse at a time. Sonita was born into an Afghanistan controlled by the Taliban. To say the least, her childhood was dangerous and challenging. Her family tried to sell her into marriage when she was 10 years old, but the arrangement fell through. At 14, she and her family walked all the way to Iran to flee the Taliban. Because Sonita had no legal papers, she was not allowed to attend school and worked as a cleaner to support her family. Fortunately, she was able to find an organization that helped to provide education to Afghans in the region. That was where she found her love for writing and when she began to explore music. At 16, Sonita’s family had plans to sell her again. The money earned from the arranged marriage would go to pay for her brother’s wife. So, she wrote a rap song titled “Daughters for Sale” that went viral. It not only elevated her voice—in a dangerous time and region—but it also helped make the world feel the true impact of child marriage. Her very raw bars caught the attention of a U.S.-based organization that helped her flee to Utah. Though free, she continues to share her story and work to end child marriage. Sonita is one such current; and “Daughters for Sale” offers a ripple of hope that will continue to reverberate across generations of young people who are fighting to end child marriage and all forms of oppression. She is an inspiration to the youth I serve, and I am beyond proud to share her story as a direct act against injustice. Since bringing RFK and STTP into our learning space, my students have begun to shape their outlook on the world through the lens of RFK and every human rights defender. They understand empathy and tolerance as imperatives. They work to improve the lot of others and seek to take stands against injustice whenever possible. Each year since they became involved, my students have produced Art in Service projects that tackle major issues such as child marriage. And each year, I am floored by their creativity and passion toward effecting change on both a local and global scale. I know that STTP played a key role in transforming the young man I spoke of earlier into a defender. “I consider myself a global citizen." "I have a social responsibility to my community, locally and globally." I think it absolutely serendipitous that on the anniversary of our STTP production, I testified about its impact before President Obama, distinguished guests, and several human rights defenders, including Frank Mugisha of Uganda and Ka Hsaw Wa of Burma. As soon as I returned to school the next morning, I told my students what he said and—as you’d expect from theater kids—they literally fell on the floor crying and screaming. Estella Owoimaha-Church is a secondary educator in Southern Los Angeles, where she serves an ethnically diverse population of English learners, students with special needs, and traditionally underserved youth. Owoimaha-Church is an advocate for the arts and represent several organizations, including, RFK Human Rights, Rock Your World, and #TeachSDGs. She is honored to have been named a top 50 finalist for the Global Teacher Prize, and is a co-founder of EN-ACT.